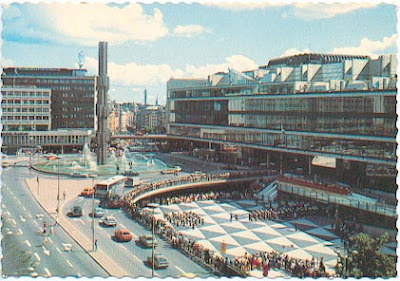 on the future of sergels torg: if i have argued earlier for restoring and strengthening architectural stature (in the particular cases of certain messed-up and mistreated architectural masterworks) - through the cleaning up and removal of clutter and removal of all kinds of added-on stuff, i.e. through reduction, when it comes to outdoor public spaces where city dwellers lead their normal lives (streets, alleys, squares and outdoor markets), i argue for the opposite: i argue for the intentional weakening of the suffocating hold or grip on the street scape of any personal/artistic/idealist/political “architectural vision” - even when that particular architectural vision must be considered “beautiful” as architecture goes, and pleasing to a city planner’s inner eye; even when considered architecturally significant, as in the case of stockholm’s downtown pedestrian nightmare in and around sergels torg. the inner city neighborhoods we all prefer to live in, and shop in, and have a good time in, are all characterized by their architectural insignificance (! ); their non-architecture status. 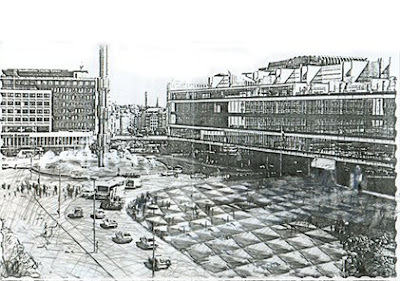 illustrations above: (1) rendering by mikael askergren (1985), showing how “sergels torg” - the sunken pedestrian plaza at the heart of stockholm’s modernist downtown - could be lifted to the level of street traffic without compromising the architecture of “kulturhuset.” (2) postcard view of sergels torg (1980s), showing “kulturhuset” (the stockholm municipal cultural center, architect: peter celsing), the super ellipse fountain/traffic roundabout, and the sunken pedestrian plaza. (3) newspaper clipping from svenska dagbladet, 3 january 2008, reporting the city government’s plans for allowing shop owners in and around sergels torg to take over the entire system of pedestrian underground tunnels, turning them into one big indoor shopping mall - plans which, however, do not include lifting the sunken plaza to street level. go ahead, turn the unpleasant underground outdoor shopping experience into a heated shopping mall, which protects shoppers from the elements during business hours, and closes its doors after business hours - like all commercial shopping malls do. nobody uses those underground walks at night anyway, people prefer staying on top; in spite of the great effort planners once made to make all pedestrians go underground in the entire sergels torg district, people in general prefer strolling through the city on ground level, next to cars and buses - especially after dark. but, don’t stop there: cover the sunken pedestrian plaza with a new one on street level as well. putting “a lid” over the sunken plaza would provide even more surfaces for shopping underground (beneath the “lid” which would cover the sunken plaza), and simultaneously provide an entire new public square in front of peter celsing’s cultural megacenter, at little cost - or no cost - for the tax payers. let the underground shop owners pay for it all. covering up and hiding from view downtown’s underground system of pedestrian tunnels will certainly make sergels torg, and the street scape around it, less “architectural” (the original intentions of the planners who designed this section of the city will be less evident to the naked eye). it will, however, make modernist downtown stockholm all the more functional - and pleasant - to the people who use these spaces every day. 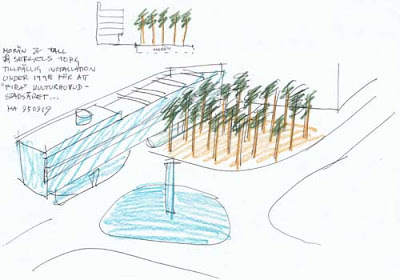 illustration above: (4) rendering by mikael askergren (1995), showing how the sunken plaza could be turned into a public park, if used as a “flowerpot,” filling the already existing whole-in-the-ground with earth, and with the kind of slender pine trees which are typical for scandinavia, and which would accompany peter celsing’s architecture well. read more about this particular pine tree project here. i’ve said it before, again and again: art is reduction. life is addition. life and art are incompatible. architecture is reduction. urbanity is the opposite of architecture; is addition. urbanity and architecture are incompatible. do not confuse the two!!! this incompatibility between life and art is, as such, in and by itself of course no problem (of course it isn’t: it’s not a problem for life, nor is it a problem for art). it does however become a problem (often a great problem) when artists get confused about the two. in the streets and alleys and public parks of our cities, where we live and love and work and toil, “life” is more important than art, urbanity is more important than architecture.